Whilst they are much scorned and sneered at now some of these kits, in their day, represented pretty much the only game in town and much blood, sweat and tears was expended in the English-speaking world and perhaps elsewhere turning them into respectable if humble replicas. 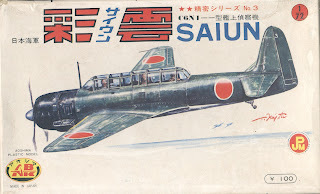 We will probably never again see the like of modelling articles earnestly correcting the Aoshima Saiun, where anything that didn't come in the box was hand crafted or looted from another kit. 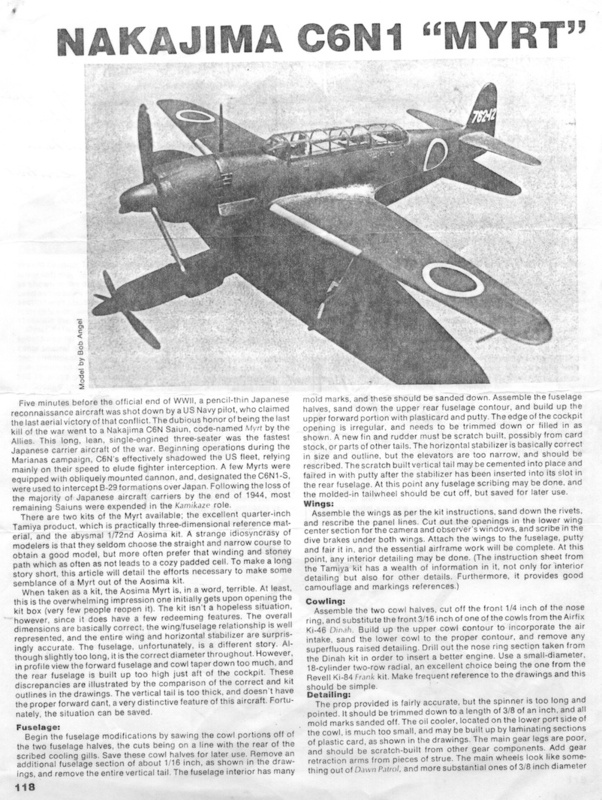 In 1974 Bob Angel wrote an article for Replica in Scale (Vol 2 No. 3 & 4), describing how he had improved this kit, turning it into a respectable looking model with nothing more than plastic card, putty and a cowling from an Airfix Dinah. I don't know whether Bob is still around, but if he is I hope he won't mind me reproducing his fine article in its entirety here, not just to demonstrate what was once done with so little but just in case anyone else should fancy treading in his pioneering steps. 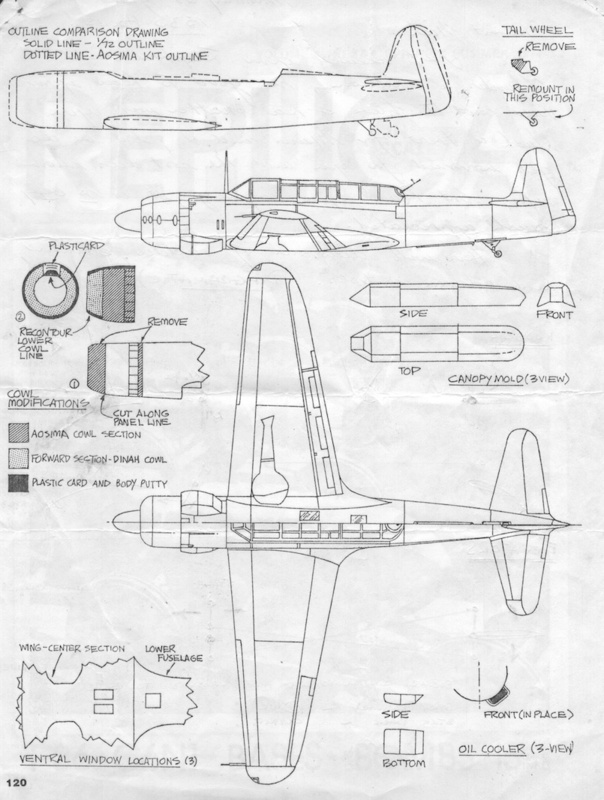 The sketch page accompanying the article could teach some modern modelling magazines a thing or two as well - it has everything needed to embark on the adventure. The Aoshima kits came into the UK via Richard Kohnstam Ltd whose large black and gold "RiKo" logo stickers permanently disfigured many a fine box. It is hard now to articulate the reaction upon first encountering these kits because of the thousand-fold modelling delights of the intervening years. The boxes were robust and very glossy, with almost lurid art and the promise of working details on the sides. The plastic was at first dark green, then grey with the odd white and finally petrol blue, at first brittle and subsequently rubbery. 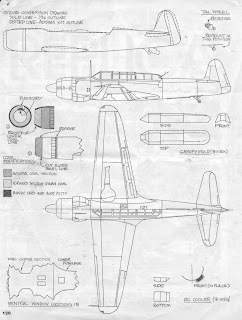 The parts were chunky and marked with sparse rivets, although the surface detail was inconsistent even in the same kit. 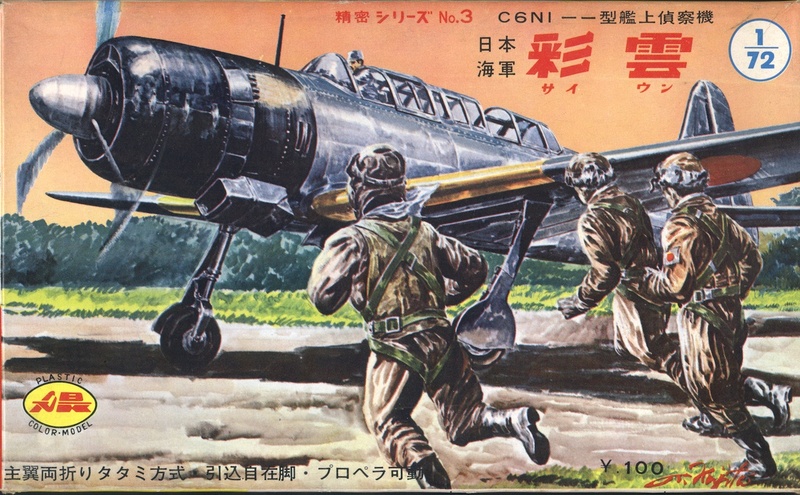 There was no interior detail, with constipated pilot figures half way through a teleporting sequence and sparse decal sheets of plain Hinomaru but nothing else. But you know what? When I pick them up now I still do so fondly, marvelling at their innocent but strangely attractive crudeness. Nothing more than an old man's nostalgia probably, but there is quite a growing trend of simple, retro modelling on Hyperscale, of getting the best from old kits without turning a sow's ear into a silk purse and above all enjoying the fun of doing so. I hope this continues. There is something quite daunting in the prospect of not just the prices of modern kits but the fact that one is often expected to buy almost the whole kit all over again in expensive resin correction sets to avoid the embarassment of an inaccuracy somewhere - take out mortgage, jack up plastic engine, fit new resin aircraft. Every new kit, representing a state of art that the eager purchasers of Aoshima kits in 1964 could not even dream of, seems to get picked over until the "fatal flaws" are found and become the imperative for a lucrative aftermarket trade. In the face of this the veteran Aoshima kits of 1964 truly represent a journey from the sublime to the ridiculous! Some of the kits were re-boxed and sold in the USA and UK under the Entex, UPC, Farpro, Air Flash and BMW logos (not the car manufacturer but the BMW Models shop in Wimbledon!) 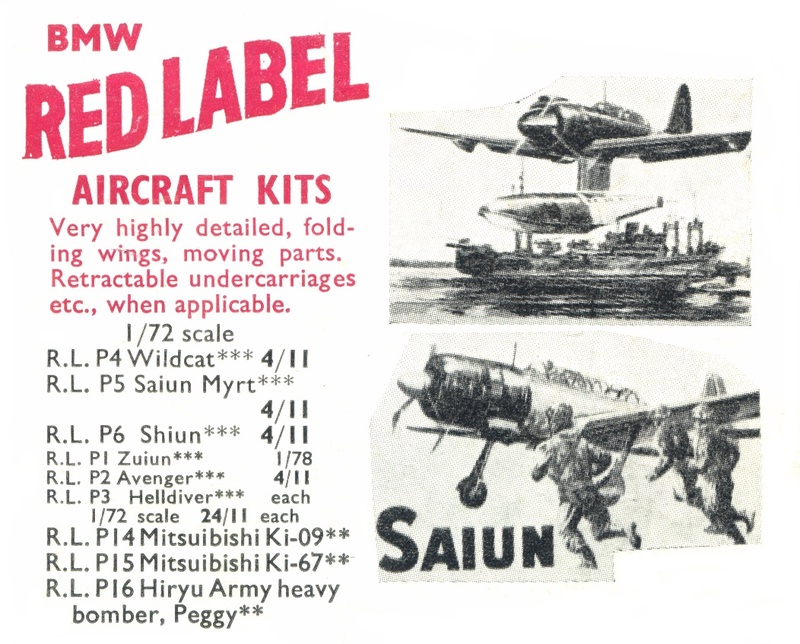 The latter marketed the Japanese kits collectively under their "Red Label" logo and the Aoshima kts were selling for 4/11d in 1966 (four shillings and eleven pence - about 25p). Airfix Series One kits at the time were 2/3d (about 11p) so until quite recently the relative prices of home grown and Japanese kits have maintained some sort of relativity. A school friend of mine had the Zuiun and it was the first one I saw close up in the plastic. Exotic didn't quite cut it - it seemed strange. 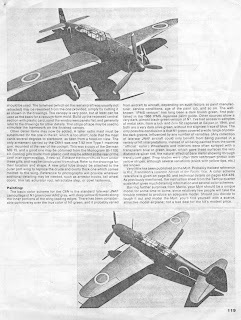 Our parochial sensitivities were such at the time that anything not Airfix was to be treated with suspicion if not disdain. Prejudice against foreign products was ingrained and the war was still a close enough memory for some parents to frown on if not forbid Japanese and German models. 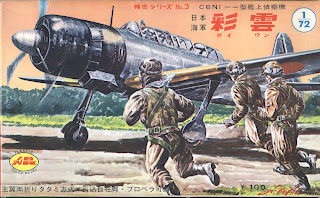 If anyone still has any built up models from Aoshima kits of Japanese aircraft I would love to see them and show them here. Or any memories of building them or about them - good or bad. Nick: I remeber those early Aosima kits quite well. They remind me of FROG kits with the basic presentation. Iused the front part of the Kawasaki Ki-100 Goshikisen - 1/70, to kit bash an early KI-100 with the Revell Ki-61 in 1/72. To my eyes at the time it came out pretty nice..
[IMG]http://i2.photobucket.com/albums/y14/cpngroats/P9190032groupphotoKI100.jpg[/IMG] I bought most of my Aosima kits while stationed in Okinawa [USN-Security Group], at that time 1/72 kits went for .30 cents, USD. Unless I am mistaken, it was Bob Angel who had a prize-winning 1/72 Hasegawa H6K Mavis at the IPMS-USA Nationals in Dallas in 2002. I had always thought that the kit could be turned into something really special, and the irony is that I saw this proven there beyond all expectations not only by Bob's model, but by the same kit built by Steve Hustad. They were both exquisite, and each in their own style. It tickles me now to imagine the look on each one's face upon seeing "the other Mavis." Life is unfair! Nicholas, we missed you! Welcome back! Thanks for those memories, ggc and Mark! Thanks Nick- for bringing those kits alive again!